You may receive a IRQL_NOT_LESS_OR_EQUAL Blue Screen of Death (BSOD) Error when installing Windows Server 2008 R2 x64 and x86. This article will attempt to discuss a possible workarounds for this particular blue screen error. If you’ve ever tried to install Windows Server 2008, Server 2008 R2 or even Vista, you may have come up against the IRQL_NOT_LESS_OR_EQUAL Blue screen of death (BSOD) STOP: 0x0000000A error. This is sometimes caused due to driver issues with peripheral devices or storage hardware. It can also manifest itself due to memory problems which crop up due to over-clocking. "This Stop message indicates that a kernel-mode process or driver attempted to access a memory address to which it did not have permission to access. The most common cause of this error is an incorrect or corrupted pointer that references an incorrect location in memory. A pointer is a variable used by a program to refer to a block of memory. If the variable has an incorrect value in it, the program tries to access memory that it should not. When this occurs in a user-mode application, it generates an access violation. When it occurs in kernel mode, it generates a STOP 0x0000000A message. If you encounter this error while upgrading to a newer version of Windows, it might be caused by a device driver, a system service, a virus scanner, or a backup tool that is incompatible with the new version." Do you have 512MB of RAM? If not add more memory. Windows Server 2008 has a minimum RAM requirement of 512 MB. Are you over-clocking your memory to operate at unsupported speeds. If so, throttle back the memory speed to ensure that it is operating at designed speeds. If you’re experiencing this error while installing Windows, the installer may be more sensitive to the memory speed that the actual Operating System. Throttle back during installation and try to over-clock once the system is installed. Your Windows blue screen error may be the result of some driver incompatibilities. It is important to remove any unnecessary peripherals, such as printers, USB devices such as scanners or cameras and even USB memory sticks from your computer. If you’re experiencing this problem during installation, try to unplug all unnecessary devices from your computer and try installing again. The Windows blue screen of death (BSOD) error may also be caused by drivers which you may not be able to change, such as the physical hardware of your hard disk controller. If this is the case, contact your manufacturer for information regarding problems on your computing platform. 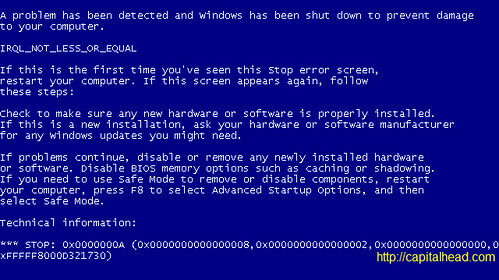 The blue screen IRQL_NOT_LESS_OR_EQUAL STOP: 0x0000000A error is quite common during installation of Windows Server 2008, Vista or Windows Server 2008 R2. This article suggested some workarounds and solutions to try in order to complete the installation or fix a driver issue.